My neighbor gave me some lemons, and I just happened to have a little sour cream leftover, so I decided to make a lemon tart. 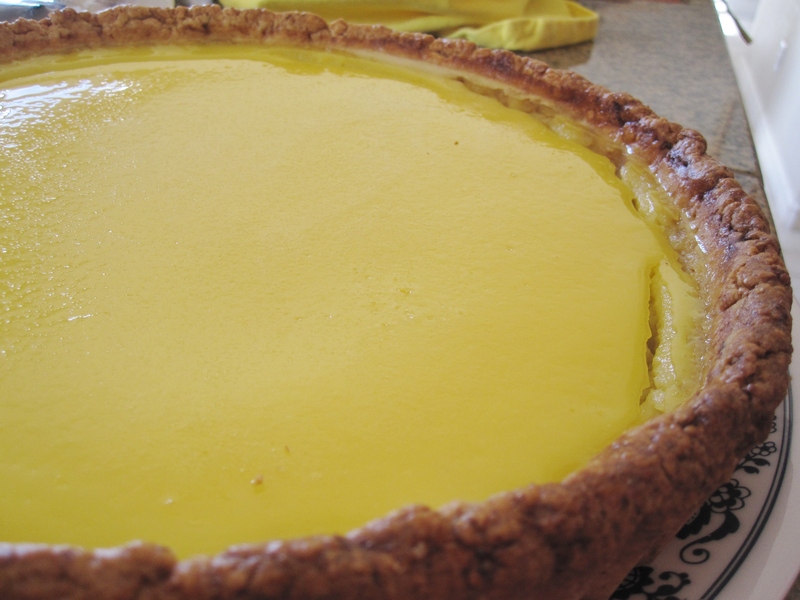 This is by far one of my best tart crust recipe (actually it’s same ingredients as in my Tarte aux Noix II). The crust has a much flakier/crumbly crunchy texture (even eaten the next day) than traditional pastry recipes that call for cold butter and cold water. 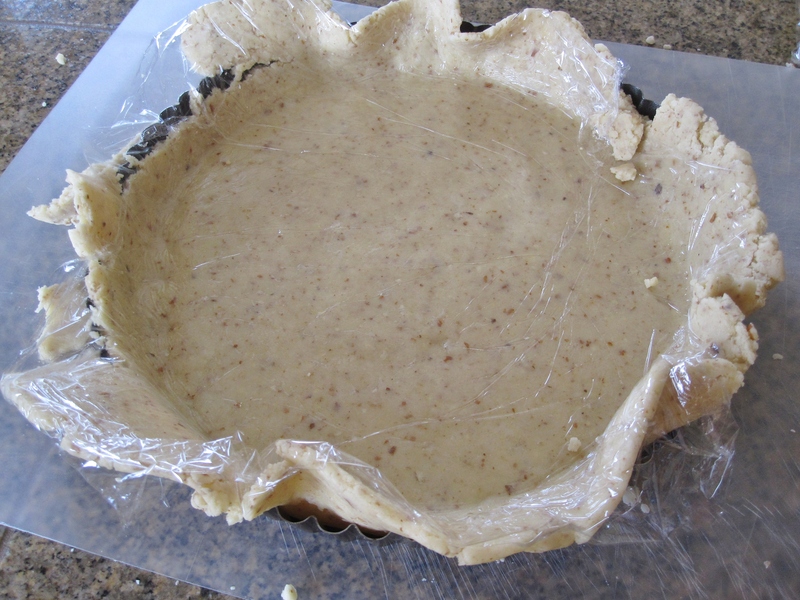 Tips: don’t fork the dough too hard, or the filling will leak through the crust and the tart will stick to the pan. Also, always place a baking tray under the tart while baking to prevent leaked filling dripping down to the bottom of the oven. Whisk butter with a hand whisk until smooth and creamy, add sugar and continue whisking until fluffy. Add beaten eggs, one tbsp at a time, and mix well. Sift in 1/3 of combined dry ingredients (flour, ground almond and salt). Use a spatula to gently mix to combine. Sift in remaining dry ingredients in 2 batches, but use the spatula to gently stir and press down so the dough will stick together to form a dough. Transfer dough onto a work surface cover with large sheet of plastic wrap. Pat dough into a disc of 1 inch thick, then place another large sheet of plastic wrap on top of the dough (this is to keep work surface cleaner, see picture 1). Use a rolling pin, roll out the dough large enough to cover the bottom of tart pan, plus extra 1.5 inch extra around the bottom tart pan for the side of tart shell (place the removable tart pan bottom on top of roll out dough– plastic wrap will keep the pan clean). 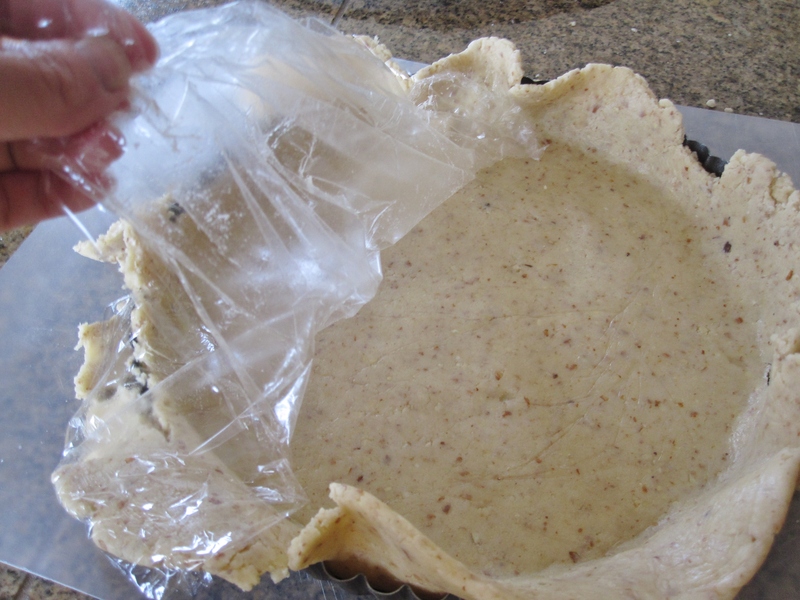 Remove the top plastic wrap and carefully flip the dough into greased tart pan (at this point the bottom plastic wrap will end up on the top, see picture 2). 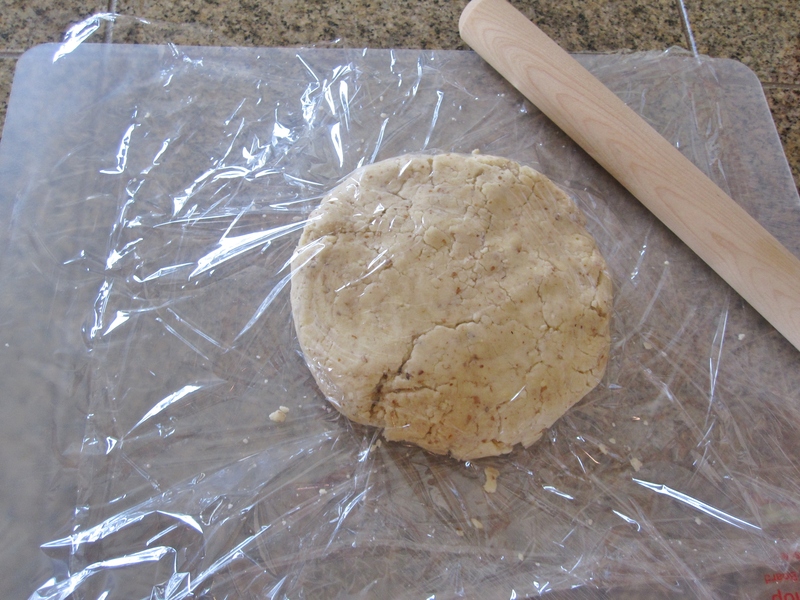 Peel away the remaining plastic wrap and tuck in/trim the over hang dough (picture 3 & 4). Prick the bottom with a fork. Blind bake in preheated 350°F oven for 25-30 minutes until lightly golden, piercing with fork if crust bubbles. Cool crust on rack for 15 minutes before adding filling. Add lemon juice and sugar in a bowl and whisk to combine. Whisk in sour cream. Slowly pour in beaten eggs and whisk to blend well. Strain the mixture into the cooled crust. Bake in preheated 350°F oven for 30-35 minutes until the filling is set. Cover the crust edge with foil if it browns too quickly. Cool tart completely in the pan on a rack then chill in the fridge. Dust with powder sugar before serving. 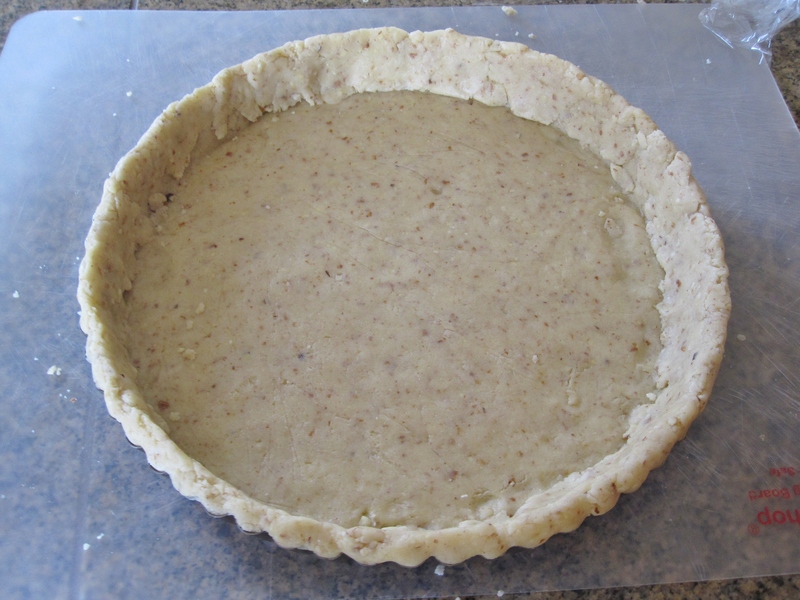 For the pastry, make the side of the tart slightly taller than the rim since it will shrink after baking. 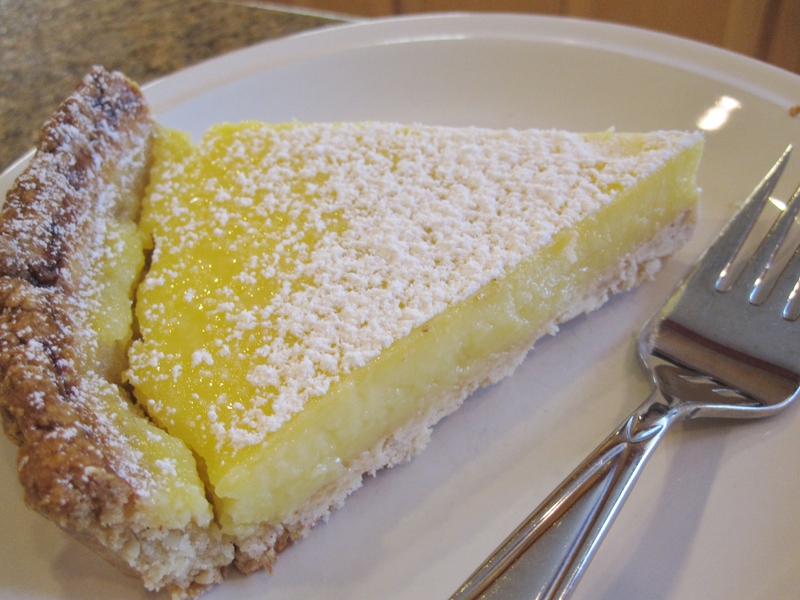 To prevent lemon tart from sticking to the tart pan, always grease the tart pan, and don’t prick the dough too hard, or the filling will leak through the crust. Always place a baking tray under the tart pan while baking, this will help transporting the tart and also to prevent leaked filling dripping down onto the oven racks.